This past week we built our 3 millionth widget! At the end of last week, Matt Bolton (SparkFun's Director of Production) sent out an exciting email - his team in production had just put the finishing touches on SparkFun's 3 millionth widget! This is a pretty exciting milestone for us as a company and we have to take a moment to say "Thank You!" to all our amazing customers who helped us get to this point - without your incredible inventiveness, we wouldn't be the company we are today! It took us a bit over eight years as a company to get to the 1 million mark, but only two years to go from 1 to 3 million - pretty crazy stuff. In case you are wondering, the 3 millionth widget was an Arduino Pro Mini. 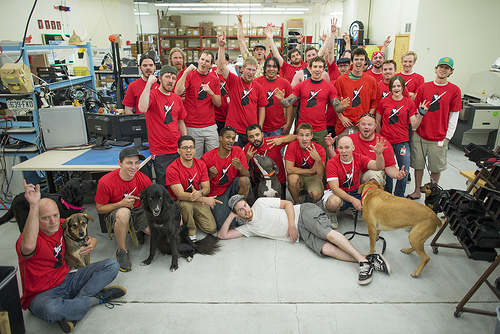 The SparkFun Production Crew, rocking their "soldering wizard" shirts, celebrating the 3,000,000th. To honor this momentous occasion, we are going to put a Pro Mini in 50 random orders this week. So if you're placing an order in the next few days, there's a chance you'll get a free Pro Mini thrown in! Thank you again, from the bottom of our geeky little hearts! Where does the Pro Mini 5V come from? Congratulations for the Sparkfun group, IÂ´m from Brazil and IÂ´m waiting my first order arrives to learn work with Arduino Boards, continue in this way that you will go much more away. The group photo demonstrates the correct amount of dog per unit volume. Actually, out of curiosity: what is SFE's cat policy? And congratulations. I think a Dr. Evil clip is in order. I must admit, I have contributed an embarrassingly large proportion of those purchases! Still, one could always use a spare FTDI breakout. Or Arduino. Or Bluetooth knickknack. Or... aw heck, sell me another million! Congrats guys and gals! You are a fantastic team changing my projects and the WORLD! I LOVE YOU GUYS!!! Have literally driven my aspirations to become the computer engineer I'm working to become. Bit of a sausage fest, do any ladies work there? Quite a few actually. Some departments have more than others and its always changing. I'm currently one of 2 women in the techsupport department and not to long ago techsupport had more women then men (those wonderful women are still at Sparkfun, they've just moved on to bigger and better things). I do 3D work in animation and engineering, I find myself working on 20 man projects. I thought it was funny, nothing serious. That's awesome! Love the Pro Mini too- I use a lot of those of little suckers for my projects. I know! I am a solder wizard! Any chance you'll sell that shirt? Or maybe make a system where we send in a picture of our best soldering work to prove we deserve it? That would be so cool! CONGRATULATIONS! BUT, you guys aren't fooling me. . . those dogs in the photo are REALLY the brains behind the product. The rest of you guys simply put their designs together because you have THUMBS! Congrats to Sparkfun for their continued success, but it's unfortunate they chose this occasion to start email spamming. I also really don't appreciate the implication that I actually opted in for spam when I created my account, that was not an option. Very disappointed, I used to hold you guys higher than the typical e-tailer. Firstly...Congratulations!...Secondly...are you going to let the person who receives that exact board know that it is 'the one'? Sparkfun should frame their 3 millionth widget.